Cities in the South are faced with the double challenges of underdevelopment and poverty on the one hand and urbanisation on the other. As the developing regions of the South continue to urbanise at an incredible rate, it is clear that many cities do not have the necessary capacity to respond to the increasing needs and demands by urban residents. As a result, many new city residents have no other option but to settle in informal areas. These areas have long been associated with poor and unhealthy living conditions and, more recently, the links between these living conditions and HIV/AIDS have become increasingly clear. Research suggests that developmental factors like poverty, unemployment, gender inequality and inadequate shelter, water and sanitation all play a role in increasing vulnerability to HIV/AIDS. These conditions further affect the ability of HIV-positive individuals, households and communities to cope with the consequences of the epidemic. This in turn leads to further impoverishment and reduces the likelihood that people living in informal settlements will be able to improve their livelihoods. Yet, little attention has been paid by policy makers and planners to the relationship between HIV/AIDS and informality despite the challenge it provides for cities and the implications of the epidemic for government institutions and local government in particular. This paper argues that informality is complex and that its heterogeneous nature is not effectively understood and thus not given appropriate recognition and support. It looks at the effects of the HIV/AIDS epidemic within this context of informality and the inevitable wave of urbanisation. 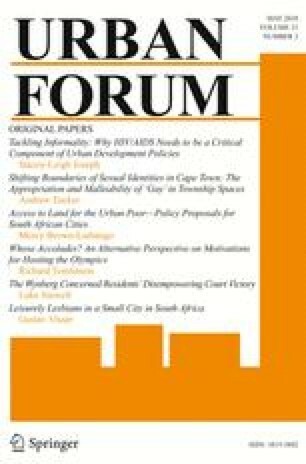 The paper suggests that the only way to deal effectively with HIV/AIDS (and informality) is through planning and building integrated and sustainable urban settlements that respond to the complexities of informality in cities of the developing world. Bodibe, K. (2007). Money as a health intervention: Living with AIDS. Health-e News. http://www.health-e.org.za/news/article_audio.php?uid=20031585. Accessed 1 February 2007. Pettifor, A., Measham, D., Rees, H., & Padian, S. (2004). Sexual power and HIV risk, South Africa. Emerging Infectious Diseases. 10(11). http://www.cdc.gov/ncidod/Eid/vol10no11/04-0252.htm#cit Accessed 3 August 2007.